My colleagues at Mindquarry have done a great job in planning the new graphical user interface (GUI) of the upcoming version 1.1 of Mindquarry Collaboration Server. Instead of long fights about believes on what users really want, they simply did usability testing. 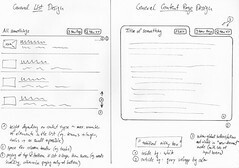 Mindquarry’s Chief Architect Alexander Klimetschek blogged about the approach and the results. His slides about User-Centered Design (UCD) for Mindquarry provide a good summary. That made me think about those Open Source projects with Web- or Desktop-based GUIs out there who think they can survive without usability tests. Maybe they think that their community will provide enough valuable usability feedback to them? I think this is a wrong assumption, because that community will most likely consist of developers. Developers are patient and used to software quirks. Quite the opposite, end users are impatient. You usually got one shot lasting 15 minutes to convince them that your software is useful. Of course, developers can provide indirect end user feedback, because they set up software for them. Yet, that’s like a Chinese whisper. Hence, go out and ask your potential users what they think. This is the most direct feedback you can get and the best and fastest approach towards a useful software product.